You may have noticed that your lips turn purple or blue in the cold, or you may have seen a baby, an elderly person or someone else with bluish or purplish lips. In many cases, this type is caused by cyanosis, which is a discoloration of a part of the body resulting from a lack of oxygen in the blood. Cyanosis can occur for various reasons, and it's not the only possible cause. Both lifestyle conditions and illnesses can lead to lip discoloration. Occasionally lifestyle causes may be to blame for discoloration of the lips. Spending too long in cold weather without proper clothing can cause lips and skin to turn blue. Such a change in lip color as a result of cold exposure can be a sign of hypothermia. If this occurs, follow hypothermia first aid care procedures and seek assistance from a qualified medical professional. 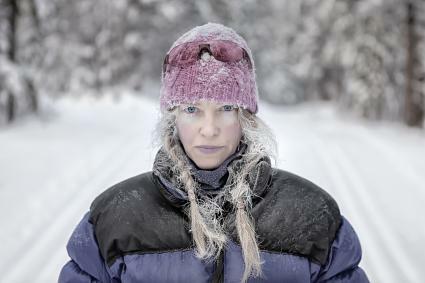 Avoiding exposure to cold, or dressing properly in warm clothing can help prevent blue lips from this cause. When living in higher altitudes, such as when mountain climbing, altitude sickness is a risk. The air at higher altitudes has less oxygen, and a lack of oxygen can lead to cyanosis. Altitude sickness can be serious, even fatal, but can be prevented by slowly acclimating to high altitudes. Severe altitude sickness is a medical emergency that is often treated by descending to a lower altitude, medications, and administering oxygen. Illness-related reasons for purple or blue lips can be serious, so it's important to seek medical attention to help identify and remedy the condition. Sometimes also called Raynaud's disease or Raynaud's syndrome, this condition causes a lack of blood flow to the extremities. When blood is not flowing properly into the lips, it results in a lack of oxygen (cyanosis), and causes a blue or purple color. Raynaud's is treated by avoiding possible triggers: smoking, caffeine, certain medications, and exposure to cold. In many cases, Raynaud's is associated with another condition, and treating that underlying condition can help with symptoms such as purple lips. Asthma is a condition that causes inflammation in the lungs and results in the inability to breathe properly. 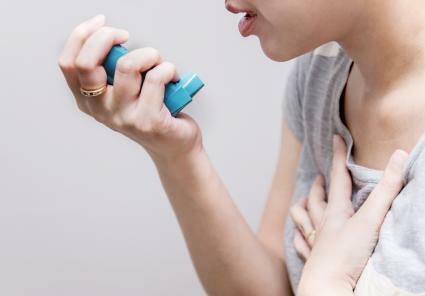 During an asthma attack, the skin or lips may turn blue because of a lack of oxygen to the body. Asthma could be triggered by stress, cigarette smoke, exercise or allergens such as animal dander, pollen, or mold. Cyanosis is a sign of a severe asthma attack that needs immediate medical attention. Treatment of asthma can include medications, as well as avoidance of potential triggers. Croup is an infection by a virus or a bacteria in the upper respiratory system that affects children. Croup is infectious, and can cause symptoms of a barking cough and a "raspy" sound while breathing. Bluish discoloration of the skin is a symptom of severe disease, which needs emergency medical attention. 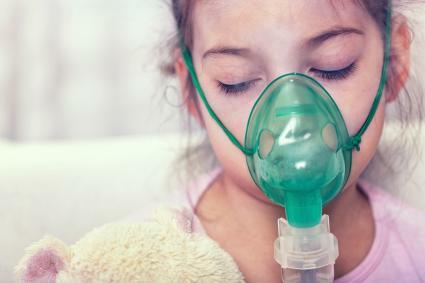 Croup is rarely treated with antibiotics (only in the case of infection with bacteria), and is more often treated with home remedies such as a humidifier, irrigation of the nasal passages with a salt solution, and rest. COPD is a condition of the lungs that causes an airflow obstruction. The lungs are not able to exhale fully, making it more difficult to breathe, and decreasing the amount of oxygen in the body. 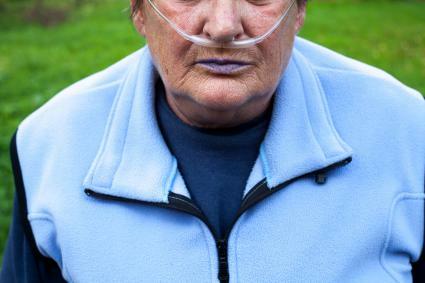 This lack of oxygen is a chronic condition that can lead to cyanosis in some cases. Many cases of COPD are caused by smoking cigarettes, but can also rarely be a hereditary condition. 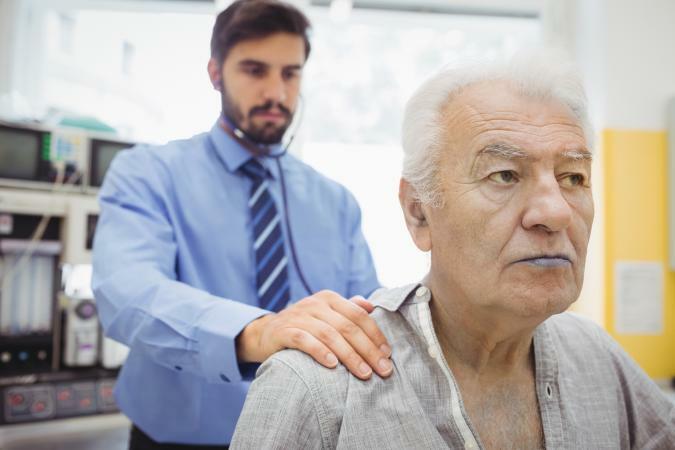 COPD is often treated with smoking cessation, inhaled medications, corticosteroids, oxygen therapy, pulmonary rehabilitation, and (infrequently) surgery. When an artery is blocked, it is called a pulmonary embolism. The blockage could be from one of a number of reasons, including a blood clot or a tumor. With an artery blocked, blood flow is going to be inhibited, which results in a number of symptoms, including cyanosis. The purple or blue color could be extensive, affecting the skin and the lips. A pulmonary embolism is a very serious condition that requires immediate treatment. If the embolism is caused by a blood clot, the treatment will include blood thinning medication to dissolve the clot. The cyanosis should resolve with successful treatment of the embolism. A congenital condition is something that a person is born with. Therefore, a congenital heart defect could affect newborns, who may have a purple or bluish tint to their skin or lips after birth. Adults may also be affected, as the defect may not cause any signs or symptoms until later in life when the heart is under more stress. Any congenital heart defect, but especially those that are called cyanotic defects, can result in blue or purple lips. Treating a congenital heart defect will depend on the nature of the condition, but could include anything from medication to surgery. In this condition, the body makes too much of a specific form of hemoglobin, called methemoglobin. Due to the high levels of this type of hemoglobin, oxygen isn't released into the body properly. This can result in cyanosis. Methemoglobinemia can be inherited, or can be caused by medications or foods containing nitrites. In mild cases, discontinuation of the medication or food is the only treatment. More serious cases may need treatment with medication or a blood transfusion. If you experience an unexplained blue or purple discoloration of your lips, it is essential for you to speak with your physician or seek medical treatment right away, as showing signs of cyanosis is not a symptom to take lightly. In some cases, the presence of cyanosis can be a serious medical emergency that requires immediate treatment.